Nakul Sahej and his friend Kuku stumble upon an antique book while on holiday in Mussoorie. 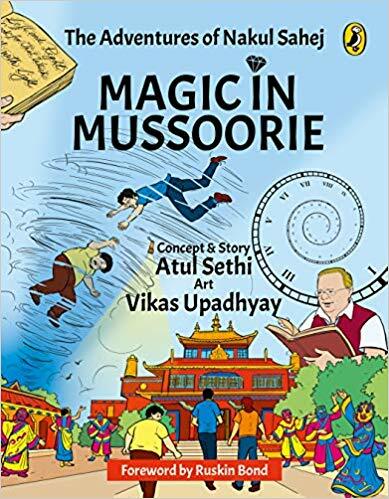 The book turns out to be a magical one that transports the two back in time to the Mussoorie of over a century ago. Meeting historical personalities of that time-like Sir George Everest, who lives in a sprawling estate on the outskirts of Mussoorie, as well as the young maharaja of Punjab, Duleep Singh, who has been exiled by the British and is spending a summer in the hill station-Nakul and Kuku get involved in an intriguing adventure that sets off a series of events which can change the course of history! Action-packed and unputdownable, this thrilling adventure is the first in a series of comic books set in the Garhwal Himalayas.